Most of you use more than one tool while doing outbound. You qualify leads in your favorite CRM, store the info about your prospects in Google Sheets, schedule meetings in Calendly, etc. Managing multiple apps means that you have different pieces of info scattered all over the apps. To keep the info up to date in every app, you need to manually update it in each app. To avoid this kind of laborious work, you may wish to synchronize the apps so that you don’t have to copy and paste information by hand. Thankfully, there is a way to do that. Use a dedicated tool, for example, Zapier. The integration with Zapier is available for Woodpecker users at the Team Pro plan. Zapier has more than a 1000 apps in their arsenal. Those apps are sorted into categories that range from those aiding you in doing sales or marketing to those that ease your office management tasks. Zapier works on a trigger-action basis. It means that if an event you set up in App A happens, it prompts another event you chose to happen in App B. The full process is described in the blog post in which Cathy announced Woodpecker + Zapier integration. Woodpecker has 10 triggers available in Zapier. The majority of them are concerned with the way a prospect behave right after they receive an email from you. The most widely used Zapier trigger among Woodpecker users is ‘Prospect Interested’. It means that whenever you mark prospect as ‘Interested’ in Woodpecker, you start an action in the other tool. ‘Prospect Replied’ runs close second as the most popular trigger and ‘Email Opened’ is on the third place. The crucial thing is how we can use those triggers to facilitate our workflow. I’ll give you some examples of how they are used in Zapier by Woodpecker users. Many people use ‘Prospect Interested’ to trigger an action in Pipedrive. Whenever they mark a prospect as ‘Interested’, that prospect is automatically added to Pipedrive as a deal. Zapier users tend to use Zapier + Zoho CRM integration too. Whenever a prospect replies in Woodpecker, they’re added to Zoho CRM as new Zoho contacts. You can activate 3 actions in Woodpecker via Zapier. The most widely used is ‘Create/Update Prospect in Campaign’. Some of the zaps feature ‘Stop Follow-Ups’ which tells Woodpecker not to send follow-up messages to a chosen prospect. For instance, Woodpecker users transfer prospects to their campaigns from a new Google Sheets rows they’ve just added via Zapier. To set up such a zap, you need to choose Google Sheets as your trigger app and Woodpecker as the action app. Choose ‘New Spreadsheet Row’ as your trigger and ‘Create/Update Prospect in Campaign’ as your action. Paste API keys when asked to do so and test your zap to see whether it works or not. Another example of how Zapier may make your work easier is syncing Woodpecker with Facebook Lead Ads. You can create new prospects in Woodpecker from the leads you got through your Facebook Lead Ads. While you’re setting up Woodpecker as an action app, you also have a search option available. It finds prospects by their email addresses in Woodpecker. This may be important when you want to add or change information about the prospects on your list from other applications. But the most interesting one from all recent updates in Woodpecker + Zapier integration is another update in Woodpecker actions, that is ‘Create/Update Prospect’. Let’s imagine such a situation. You collect info about your prospects through a form you set up on your website. Once someone enters the website, they may leave some information in the form and agree to be contacted by you. Once they submit the form, you can automatically transfer the data they provided to a Woodpecker campaign. The information from the form can be used as snippets (dynamic fields) to customize your email copy especially for them. 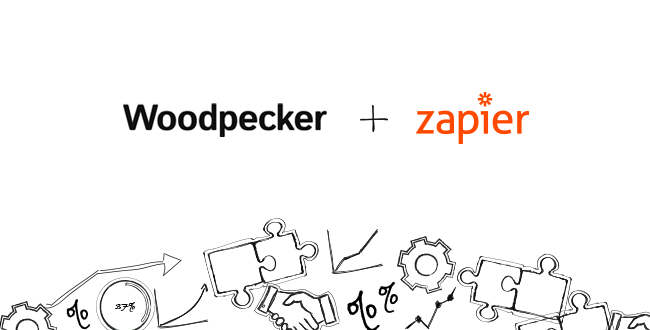 If you wish to know more about Woodpecker + Zapier integration, check out our help section. 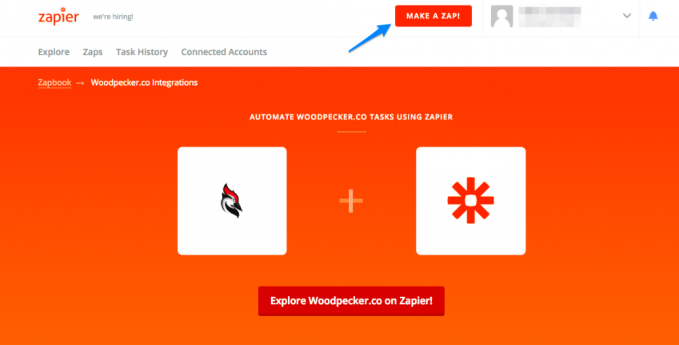 Set up a Zapier account and integrate Woodpecker with the apps you’re already using.